Abhi Singharoy received Bachelor's Degree from Saint Xavier's College, University of Calcutta in 2005. He completed his Master's degree from the Indian Institute of Technology Bombay in 2007 before moving to Indiana University Bloomington for PhD in Chemistry under the auspices of Prof. Peter J. Ortoleva. The underlying theme of his research is to delineate ways in which laws of physics and chemistry operate across a diverse range of scales in space and time to yield biologically relevant structure and function. 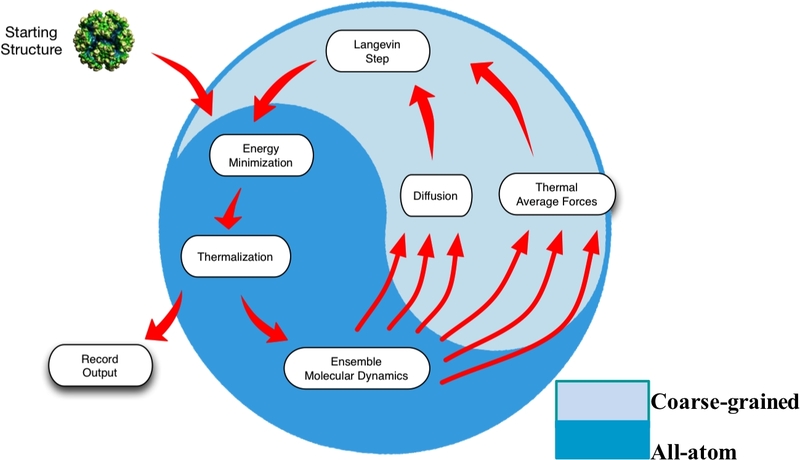 Specifically, his work focussed on the develoment of multiscale methods that extend all-atom simulations of macromolecular systems to biologically relevant timescales (Figs. 1 and 2). This technique is applied to the computer-aided design of vaccines against the Human Papilloma Virus (Fig.3). In 2013, he has joined the TCB group as a Beckman postdoctoral fellow. One of his initial endeavours involved the development of methods for obtaining all-atom structures that interpret low resolution X-ray crystallography data. The molecular dynamics flexible fitting-based method, xMDFF, is now successfully developed (Fig.4), and finds application in refining the structure of inherently disordered trans-membrane systems (Fig.5). Another key ingredient of Abhi's research iniative at Beckman is an atomic-scale study of protein insertion into the bioenergretic membranes of photosynthetic organisms, and exploring the pathways of energy transiduction across these photosynthetic proteins which finally leads to ATP synthesis. To this end, he is studying various factes of the photosynthetic chromatophore in purple cyanobacteria. 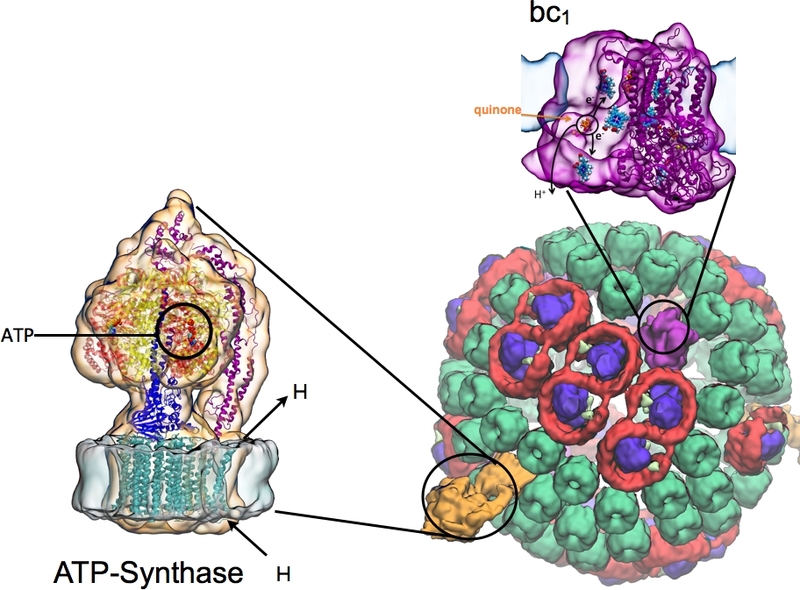 First, in collaboration with the Beckmann group at Munich, he revealed tha atomic structure of YidC, an insertase that recruits photosynthetic proteins in membranes (Fig. 6). Next, employing state-of-the-art transition path sampling techniques he is studying the mechanism of protein insertion into biomembranes via YidC, and the functioning of the inserted proteins within the entire photosynthetic machinary; he is primarily focussing on the role of the bc1-cytochrome c2 complex and ATP synthase in the photosynthetic mechanism of Rhodobacter Sphaeroides (Fig.7). Though individual proteins form key components of the entire photosynthetic machinary, it is the cross-talk among these subunits that yields a fully functional organelle. To capture the larger-scale manifestations of this inter-protein synnergy, which has also been the philosophy underlying Abhi's graduate studies, he is now simulating, for the first time in all-atom details, an entire chromatophore including 67 LH2s, 11 LH1 dimers, 2 LH1 monomers, 4 bc1 complexes, and 2 ATP synthases (Fig.7). 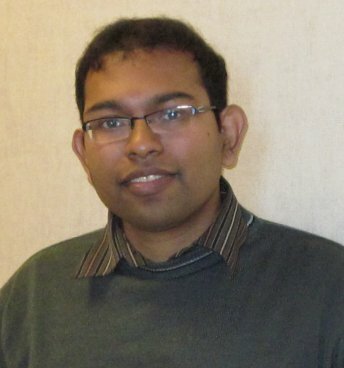 Abhi's interdisciplinary research projects in Indiana have been heavily funded by the National Science Foundation's Collaborative Research in Chemistry inititave , and now at Illinois his work serves as one of the leading projects for the National Institute of Health funded Glue Grant on membrane protein structural dynamics. Affiliate Department: Beckman Institute for Advanced Science and Technology. Office Address: Beckman Institute, Room 3125. Electrostatic effects in nanosystems can be understood via a physical picture built on their multiscale character and the distinct behavior of mobile ions versus charge groups fixed to the nanostructure. In Ref.,the Poisson-Boltzmann equation is nondimensionalized to introduce a factor lambda that measures the density of mobile ion charge versus that due to fixed charges; the diffusive smearing and volume exclusion effects of the former tend to diminish its value relative to that from the fixed charges. A ratio sigma of the average nearest-neighbor atom distance to the characteristic size of the features of the nanostructure of interest (e.g., a viral capsomer)is introduced to show that a unified treatment (i.e., lambda proportional to sigma), and a perturbation expansion around sigma=0, yields, through analytic continuation, an approximation to the electrostatic potential of high accuracy and computational efficiency. The approach was analyzed via Padé approximants and demonstrated on viral system electrostatics (Fig. 1); it can be generalized to accommodate extended Poisson-Boltzmann models, and has wider applicability to nonequilibrium electrodiffusion and many-particle quantum systems. Fig. 1. 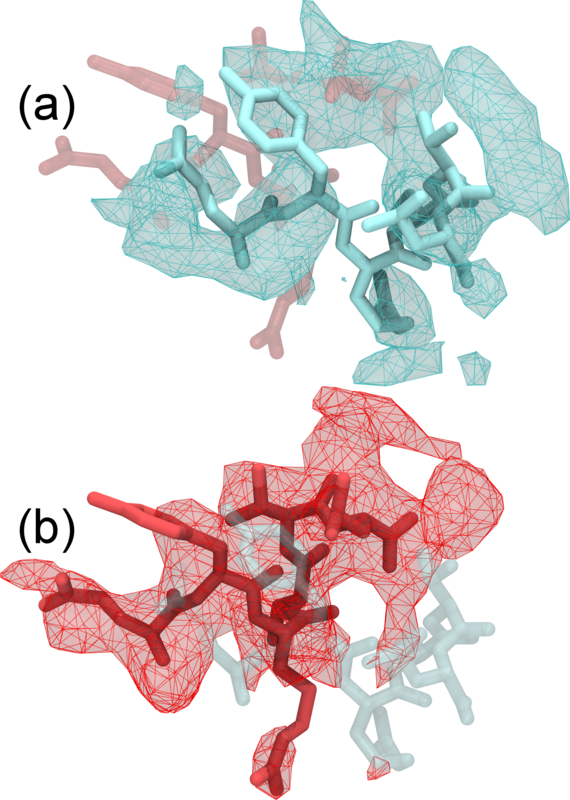 +1 KT/e (blue) -1KT/e (red) potential isosurfaces for Simian Virus40 capsid immersed in 0.125 M NaCl computed using multiscale Poisson-Boltzman solver (PBms) ; (a) external view; (b) cut-away view; (c) the -35KT/e (pink) isosurface, black dots are used to represent the hexavalent symmetry of the potential distribution; and (d) Ca2+ binding sites on the SV40 surface. A multiscale mathematical and computational approach is developed in Refs. , , and  that captures the hierarchical organization of a microbe. It is found that a natural perspective for understanding a microbe is in terms of a hierarchy of variables at various levels of resolution. This hierarchy starts with the N-atom description and terminates with order parameters characterizing a whole microbe. This conceptual framework is used to guide the analysis of the Liouville equation for the probability density of the positions and momenta of the N atoms constituting the microbe and its environment. Using multiscale mathematical techniques, we derive equations for the co-evolution of the order parameters via Langevin dynamics equations together with the probability density of the N-atom state (Fig. 2a) . This approach yields a rigorous way to transfer information between variables on different space-time scales. It elucidates the interplay between equilibrium and far-from-equilibrium processes underlying microbial behavior. Fig. 2a. Multiscale feedback loop underlying our Langevin-dynamics computations that captures the omnipresent cross-talk between atomic and CG variables, as it simulates the structure and dynamics of large macromolecular assemblies such as viruses. Fig. 2b. Multiscale simulation results at equilibrium shows pentamer CM distance oscillates radially in time. Pentamers oscillate in-phase and out-of-phase with one another represented by the colors red and yellow, respectively. (right) Spatial representation of the 12 pentamers in the T = 1 VLP structure showing in-phase (red) and out-of-phase (yellow) pentamers. The methods developed above in Ref. also provides framework for using coarse-grained nanocharacterization data to guide microbial simulation [4,5]. It enables a methodical search for free-energy minimizing structures, many of which are typically supported by the set of macromolecules and membranes constituting a given microbe . This suite of multiscale capabilities provides a natural framework for arriving at a fundamental understanding of microbial assembly, as demostrated via the simulations of large-scale oscillatory modes underlying the structure of a stable human papilloma virus (Fig. 2b), movies of truncation-mediated virus disassembly here and here, and pH or temperature induced structural transitions in Refs. [6, 8, 10-11]. Our methods further enable the analysis of nanocharacterization data , and the computer-aided design of nanostructures for biotechnical and medical purposes as discussed next. In Refs. and  the dynamic properties of the capsid of the human papillomavirus (HPV) type 16 were examined using classical molecular dynamics simulations. By systematically comparing the structural fluctuations of the capsid protein, noted L1, a strong dynamic allosteric connection between the epitope containing loops and the h4 helix located more than 50 Å away is identified, which was not recognized thus far. Computer simulations show that restricting the structural fluctuations of the h4 helix is key to rigidifying the epitopes, which is thought to be required for eliciting a proper immune response . The allostery identified in the components of the HPV is nonclassical because the mean structure of the epitope carrying loops remains unchanged, but as a result of allosteric effect the structural fluctuations are altered significantly, which in turn changes the biochemical reactivity profile of the epitopes. Exploiting this novel insight, a new vaccine design strategy is proposed wherein a relatively small virus capsid fragment is deposited on a silica nanoparticle in such a way that the fluctuations of the h4 helix are suppressed (Fig. 3). The structural and dynamic properties of the epitope carrying loops on this hybrid nanoparticle match the characteristics of epitopes found on the full virus-like particle precisely, suggesting that these nanoparticles may serve as potent, cost-effective, and safe alternatives to traditionally developed vaccines. The structural and dynamic properties of the hybrid nanoparticle are examined in detail to establish the general concepts of the proposed new design. Fig. 3. Computer-aided vaccince design protocol agaisnt Human Papilloma Virus type 16, the causitive agent of cervical cancer. First, a flat sheet of silica generated using CHARMM is curved using SMD and the T = 1 VLP as a template. Then, tethers are planted on the curved hydrophilic silica surface forming a -Si-O-(CH2)3-NH2 linkage. Finally an L1 pentamer is attached to the surface via the tethers with the connectivity silica-Si-O-(CH2)3-NH-CO-L1. Surface fluctuations of the resulting bionano-hybrid mimics that of a complete T=1 VLP vaccine and is thus expected to elicit comparable immune response as the latter. The hybrid is more thermally stable that the capsid-based vaccine, and much simpler to synthesize. X-ray crystallography remains one of the most versatile and dominant methods for solving the all-atom structure of biomolecules. However, for relatively large systems, availability of only medium to low-resolution diffraction data often limits the determination of atomic structures. 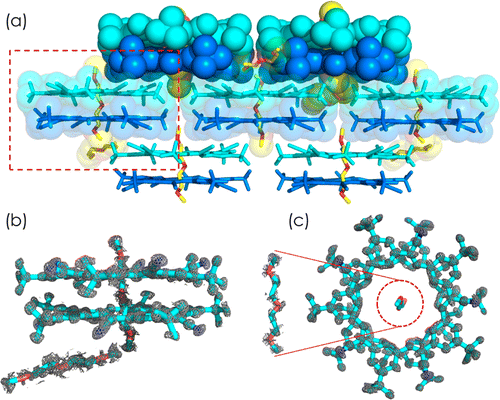 We have developed a new molecular dynamics flexible fitting (MDFF)-based approach, xMDFF , for determining structures from such low-resolution crystallographic data . xMDFF employs a real-space refinement scheme that flexibly fits atomic models into an iteratively updating electron density map (Fig. 4). Fig. 4. Refinement of highly flexible region in case of 1XDV. Substantial density improvements are observed in a flexible region of 1XDV, illustrated by the difference in the density map between the initial (a) and xMDFF-refined final (b) structure; Local cross correlations increase from 0.47 to 0.63, implying a more unambiguous placement of the atoms. You can find a movie of the refinement of this region which demonstrates the updating density maps here. xMDFF was applied to solve the structure of a voltage-sensing protein, Ci-VSP, using 3.6, 4, and 7 Å resolution diffraction data (Fig. 5) . A movie of this refinement can be found here. In ongoing developments, a MDFF-based protocol is implemented to specifically address high-resolution CryoEM data. Fig. 5. xMDFF refinement of voltage-sensing protein Ci-VSP. (a) A MUFOLD predicted homology model (cyan) was used as an intial phasing model in xMDFF; this model has an RMSD of 6 Å from an independently refined Ci-VSP structure (orange). (b) xMDFF refinement with 4 Å diffraction data produced a final structure (red) 2.6 Å away from the independently refined Ci-VSP structure with closely matching placement of the S4 helix. Very recently xMDFF has been for structure determination of nanoscale materials employing macromolecular schemes. This abiological crystallographic refinement procedure has been used to detemine the structure of an anion sensor macrocycle, called the cyanostar. (a) Lamellar packing of cyanostar-diglyme sandwiches in the crystal. The cyanostar dimers are colored in blue and cyan, the diglymes in yellow with their oxygen atoms in red. The red box highlights the chemical components of one unit cell constituted by (b,c) a cyanostar dimer and two diglyme solvents. The integration of most membrane proteins into the cytoplasmic membrane of bacteria occurs co-translationally. The universally conserved YidC protein mediates this process either individually as a membrane protein insertase, or in concert with the SecY complex. In Ref. , we present a structural model of YidC based on evolutionary co-variation analysis, lipid-versus-protein-exposure and molecular dynamics simulations (Fig. 6). The model suggests a distinctive arrangement of the conserved five transmembrane domains and a helical hairpin between transmembrane segment 2 (TM2) and TM3 on the cytoplasmic membrane surface. The model was used for docking into a cryo-electron microscopy reconstruction of a translating YidC-ribosome complex carrying the YidC substrate FOc. 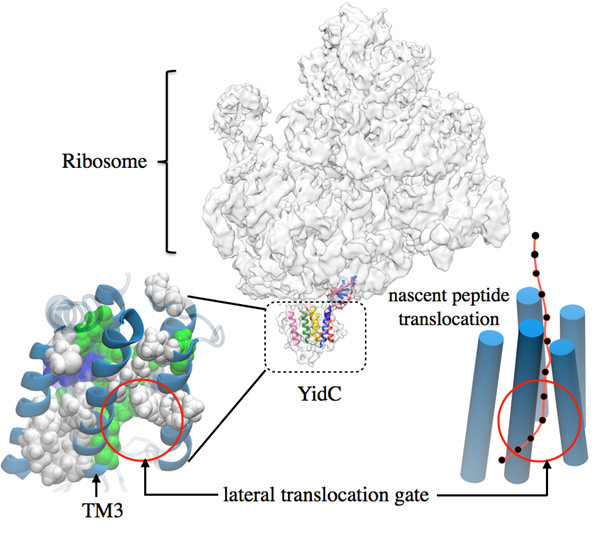 This structure reveals how a single copy of YidC interacts with the ribosome at the ribosomal tunnel exit and identifies a site for membrane protein insertion at the YidC protein-lipid interface. Together, these data suggest a mechanism for the co-translational mode of YidC-mediated membrane protein insertion. A movie describing this work can be found here . Fig. 6. Lateral translocation of the nascent peptide chain via YidC. The nascent inner membrane proteins synthesized in the ribosome, are co-translationally inserted into the membrane via YidC. A kinked helix (TM3) mediated gate has been hypothesized for lateral protein translocation. The structure of the proposed gate shown at the lower left; polar and hydrophobic residues are shown in green and white respectively. A cartoon of the prospective lateral nascent chain translocation in question is shown at the lower right. Phtosynthetic organisms have been optimized by over two billion years of evolution into highly efficient light-harvesting machines that surpass man-made solar devices in robustness, adaptation to environmental conditions, resilience against radiation damage, and optimization of energy conversion efficiency. The chromatophore is among the evolutionarily simplest light-harvesting devices; yet it contains a scaffold of over 100 protein complexes that convert incident light energy into ATP. The ongoing work involving the first ever 100 Million atom simulation in the history of MD simulations, of an entire biological organelle, namely the chromatophore, on the one hand, determine the organizational principles for solar energy harvesting in nature, thereby aiding the design of better man-made biohybrid and bioinspired devices in order to harness solar energy for the World's future energy needs; and, on the other hand, determine supramolecular integration of function across hundreds of proteins comprising an entire organelle, which is an outstanding challenge at the forefront of biomedical science today as system-level integration of cellular processes need to be described at organelle-scale instead of at the single-protein level (Fig. 7) . Reported in Refs. [19, 22-24], some of the initial results are discussed here . Fig. 7. The atomic-detail model of the complete chromatophore containing 100 million atoms, including lipids and water, prepared for the proposed simulations. Proteins shown: LH2 (green), LH1 (red), RC (blue), bc$_1$ complex (yellow), ATP synthase (orange). The universal process of ATP synthesis, also a component of the aforementioned photosynthetic energy harvesting, but far more widely employed, including in mammals, can now be investigated at atomic detail through the molecular dynamics of a complex biological motor, the ATP synthase, that transforms an ion gradient existing across the cell membrane into the synthesis of ATP from ADP. The remarkable reversibility of this mechano-chemical biomotor is essential for energy-transcending processes in all living systems, yet, the mechanism of its action remains elusive. The simulations presented in (Fig. 8) elucidate, for the first time, the atomic details underlying the bioenergetics and reversibility of ATP synthase. Fig. 8. 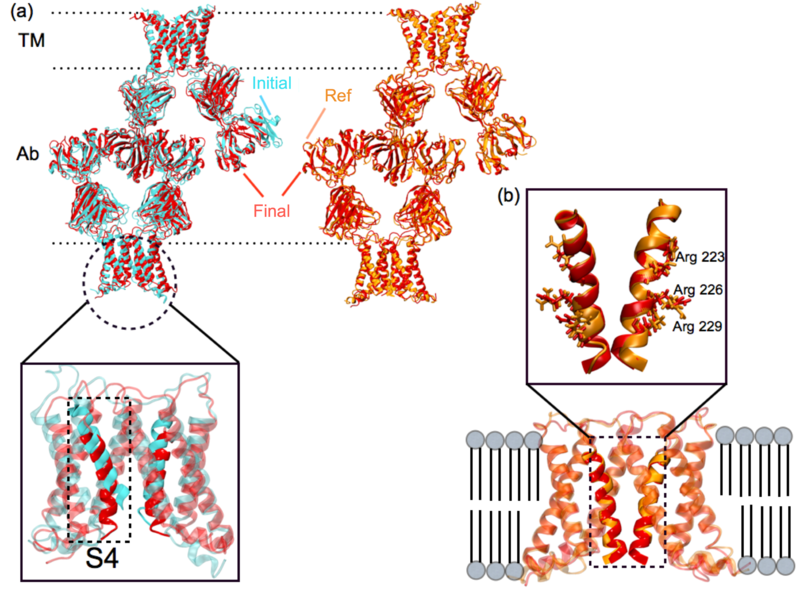 Employing a combination of transition-path sampling and high-performance free-energy methods, the sequence of conformational transitions involved in a functional cycle accompanying ATP hydrolysis has been investigated in unprecedented detail over an aggregate simulation time of 65 microseconds. Our simulated pathways reveal that the chemical energy produced by ATP hydrolysis is harnessed via the concerted motion of the protein-protein interfaces in the V1-ring, and is nearly entirely consumed in the rotation of the central stalk. Surprisingly, in an ATPase devoid of a central stalk, the interfaces of this ring are perfectly designed for inducing ATP hydrolysis. However, in a complete V1-ATPase, the mechanical property of the central stalk is a key determinant of the rate of ATP turnover. The simulations further unveil a sequence of events, whereby unbinding of the hydrolysis product (ADP + Pi) is followed by ATP uptake, which, in turn, leads to the torque generation step and rotation of the center stalk. 1. Ali, Md. E.; Singharoy, A.; Datta, S.N. Molecular Tailoring and Prediction of Strongly Ferromagnetically Coupled Trimethylenemethane-Based Nitroxide Diradicals J. Phys. Chem. A 2007, 111, 5523. 2. Singharoy, A.; Yesnik, A.; Ortoleva, P. J. Multiscale Analytic Continuation Approach to Nanosystem Simulation: Applications to Virus Electrostatics J.Chem. Phys. 2010, 132, 174112 (Reviewed in Virtual Journals in Science and Technology). 3. Singharoy, A.; Cheluvaraja, S.; Ortoleva, P. J. Order Parameters for Macromolecules: Application to Multiscale Simulation J. Chem. Phys. 2011, 134, 044104 (Reviewed in Virtual Journals in Science and Technology). 4. Joshi, H.; Singharoy, A.; Sereda, Y.; Cheluvaraja, S.; Ortoleva, P. J. Multiscale Simulation of Microbe Structure and Dynamics Prog. Biophys. Mol. Biol. 2011, 107, 200. 5. Singharoy, A.; Joshi, H.; Cheluvaraja, S.; Brown, D.; Ortoleva, P. J. Simulating Microbial Systems: Addressing Model Uncertainty/Incompleteness via Multiscaling and Entropy Methods Microbial System Biology: Methods and Protocols, Editor: A. Navid, Springer Science: New York, 2012. 6. Singharoy, A. ; Joshi, H.; Ortoleva, P.J. ; Miao, Y. Space Warping Order Parameters and Symmetry: Application to Multiscale Simulation of Macromolecular Assemblies J. Phys. Chem. B 2012, 116, 8423 . 7. Sereda, Y.; Singharoy, A.; Jarrold, M. F.; Ortoleva, P. J. An Information Theory Approach to Multiple Free-energy Basin Discovery J. Phys. Chem. B 2012, 116, 8534 . 8. 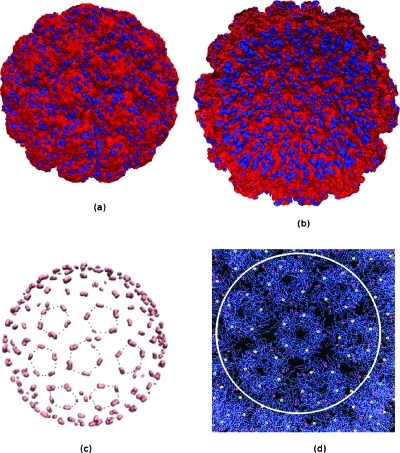 Singharoy, A.; Sereda, Y.; Ortoleva, P. J. Hierarchical Order Parameters for Macromolecular Assembly Simulation I: Construction and Dynamical Properties of Order Parameters J. Chem. Theor. Comput. 2012, 8, 1379 . 9. Singharoy, A. ; Joshi, H. J.; Ortoleva, P. J. Multiscale Macromolecular Simulation: Role of Evolving Ensembles J. Chem. Info. Model. 2012, 52, 2638. 10. Pankavich, S.; Singharoy, A. ; Ortoleva, P.J. Hierarchical Multiscale Modeling of Macromolecules and their Assemblies Soft Matter 2013, 9, 4319. 11. Quick, R.*; Singharoy, A. * ; Ortoleva, P.J. Quasiperiodic Oscillation and Possible Second Law Violation in a Nanosystem Chem. Phys. Lett. 2013, 571, 61. 12. Joshi, H.; Lewis, K.; Singharoy, A. ; Ortoleva, P.J. Epitope Engineering and Molecular Metrics of Immunogenicity: A Computational Approach to VLP-based Vaccine Design Vaccine 2013, 31, 4841. 13. Singharoy, A. * ; Polavarapu, A. *; Joshi, H.; Baik, M.; Ortoleva, P. J. Epitope Fluctuation in the Human Papillomavirus are under Dynamic Allosteric Control:a Computational Evaluation of a New Vaccine Design Strategy J. Am. Chem. Soc. 2013, 135, 18458. 14. Li, Q.; Wanderling, S.; Paduch, M.; Medovoy, D.; Singharoy, A. ; Mcgreevy, R.; Villalba-Galea, C.; Hulse, R.E. ; Roux, B.; Schulten, K.; Kossaikoff, A.; Perozo, E. Structural mechanism of Voltage-dependent Gating in an Isolated Voltage-sensing Domain Nat. Struct. Chem. Biol. 2014, 21, 244. 15. 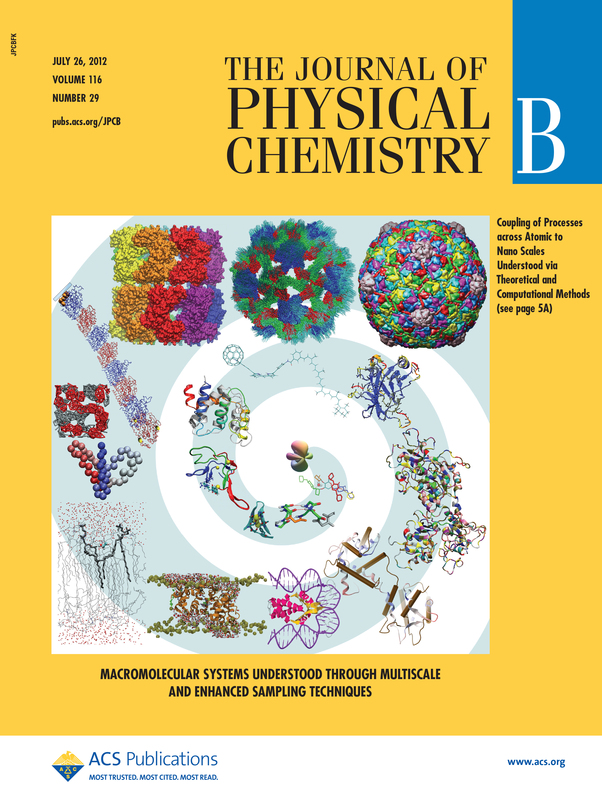 Wickles, S.; Singharoy, A. ; Andreani, J.; Seemayer, S.; Bischoff, L.; Berninghausen, O.; Soeding, J.; Schulten, K.; Van der Sluis, E. O.; Beckmann, R. A Structural Model of the Active Ribosome-bound Membrane Protein Insertase YidCi eLife 2014, 3, e03035 . 16. Mcgreevy, R.*, Singharoy, A. * ; Li, Q.; Zhang, J.; Xu, D.; Perozo, E.; Schulten, K. xMDFF: Molecular dynamics flexible fitting of low-resolution X-Ray structures Acta. Cryst. D 2014, 70, 2344. 17. Singharoy, A. * ; Venkatakrishnan, B. *; Liu, Y. *; Mayne, C.; Lee, S.; Chen, C.; Zlotnick, A.; Schulten, K.; Flood, A. Macromolecular Crystallography for Synthetic Abiological Molecules: Combining xMDFF and PHENIX for Structure Determination of Cyanostar Macrocycles J. Am. Chem. Soc. 2015, 137, 8810. 18. Singharoy, A. * ; Liu, Y. *; Mayne, C.*; Sengupta, A.; Raghavachari, A.; Schulten, K.; Flood, A. Flexibility Coexists with Shape-Persistence in Cyanostar Macrocycles J. Am. Chem. Soc. 2016, 138, 4843. 19. Sener, M.; Strumpher, J.; Singharoy, A. ; Hunter, N.; Schulten, K. Overall energy conversion efficiency of a photosynthetic vesicle eLife 2016, 5, e09541. 20. Singharoy, A. ; Teo, I.; Mcgreevy, R.; Stone, J.; Jhao, J.; Schulten, K. Molecular dynamics-based refinement and validation with Resolution Exchange MDFF for sub-5 Å cryo-electron microscopy maps eLife 2016, 5, e16105. 21. Bozzi, A.; Bane, L.; Singharoy, A. ; Chipot, C.; Schulten, K.; Gaudet, R. Conserved methionine dictates substrate preference in Nramp-family divalent metal transporters PNAS 2016, 113, 10310. 22. Singharoy, A. ; Barragan, A.; Thangapandian, S.; Tajkhorshid, E.; Schulten, K. Binding site recognition and docking dynamics of a single electron transport protein: revisiting cytochrome c2 J. Am. Chem. Soc. 2016, 138, 12077. 23. Singharoy, A. ; Chipot, C. Methodology for the Simulation of Molecular Motors at Different Scales J. Phys. Chem. B 2016 (Accepted). 24. 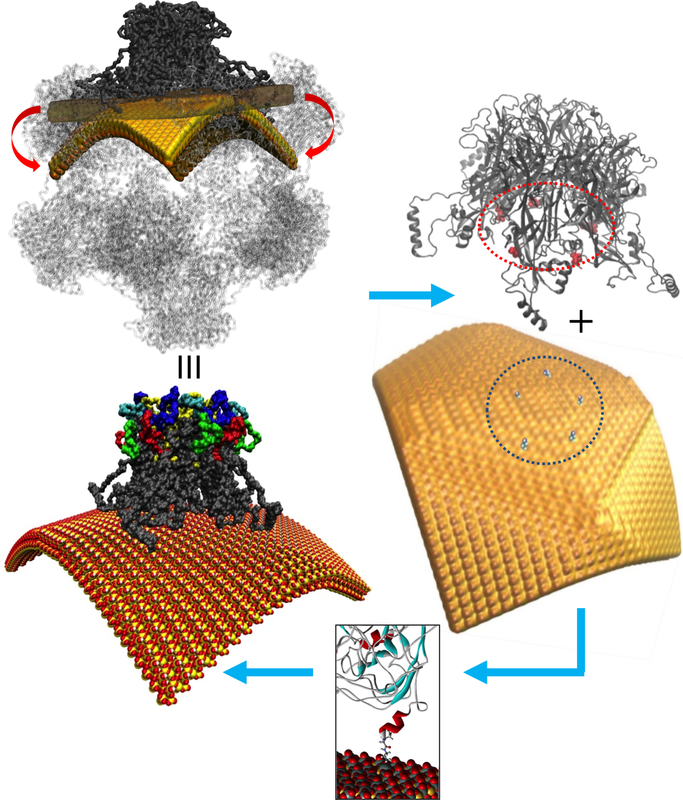 Singharoy, A. ; Moradi, M.; Chipot, C.; Schulten, K. Chemomechanical coupling in hexameric protein-protein interfaces harness energy within V- type ATPases J. Am. Chem. Soc 2016 (Accepted). Contact Us // Material on this page is copyrighted; contact Webmaster for more information. // Document last modified on 22 Jan 2018 // 11324 accesses since 16 Jan 2013 .